Rather than using the proceeds of his Hawaiian Gardens "non-profit" bingo to alleviate the city's widespread poverty, Irving Moskowitz gives the "bingo bucks" to violence-prone Israeli settlers and right-wing U.S. political groups. In this section we profile recipients of Moskowitz's largesse outside Hawaiian Gardens. Except for the "neocon" Center for Security Policy, most are little-known in the United States but they share a common trait -- all are either opponents or outright obstacles to past, current and future Middle East peacemaking efforts. Click here to see their profiles in the Moskowitz Gallery of Political Extremists. 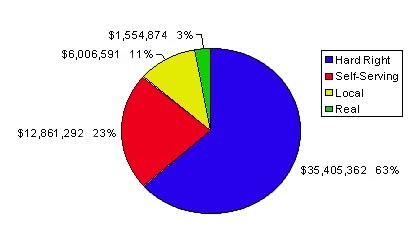 As the chart shows, between 1987 and 2001, Moskowitz donated $55,828,119 from the Hawaiian Gardens Bingo to nearly 300 different organizations. While he gave money to many "real" educational institutions and organizations that support veterans or distribute food to the needy, the vast majority of his money went to settler groups and other organizations we call "hard right" because they advocate extreme positions. As the chart below illustrates, almost two-thirds of the Moskowitz Foundation's donations were made to hard right groups. In addition, 23 percent of the donations went to groups that Moskowitz himself benefited from, like the food bank and hospital in Hawaiian Gardens, which assured his political influence in the city. Another 11 percent of the donated money went to other local agencies that he stood to benefit from. That means that just 3 percent of the money was donated to "real" charitable organizations. Of $55.8 million given out over 15 years, less than $1.6 million was given to groups that don't promote violence against Arabs, attempt to force Palestinians out of their homes, or make Irving Moskowitz a richer, more powerful man.